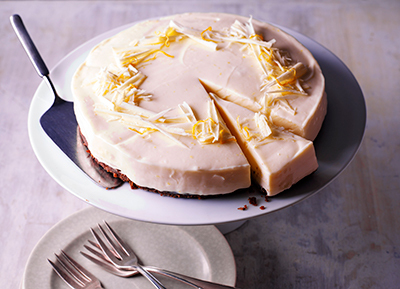 Carnation's delicious cheesecake gets its sweetness from white chocolate, zestiness from lemons and its sublimely creamy texture from the Carnation condensed milk. Melt the butter in a pan, then add the crushed cookies, stir until the chocolate is slightly melted. Press into the base of the tin and chill for 10 minutes. Pour the condensed milk into a large bowl. Add the cream cheese and lemon juice and whisk together with an electric hand held mixer, until smooth. Whisk in the zest, then stir in the white chocolate until well combined. Pour the mixture over the set biscuit base, smooth over the top slightly. Place in the fridge and chill until set, turn out of tin to serve and decorate with white chocolate curls and lemon zest.